Masip, J. 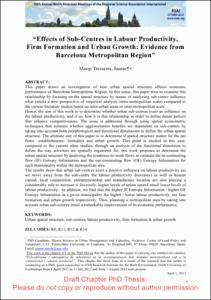 Effects of sub-centres in labour productivity, firm formation and urban growth: evidence from Barcelona Metropolitan Region. A: Annual North American Meetings of the Regional Science Association International (NARSC-RSAI). "59th Annual North American Meetings of the Regional Science Association International (NARSC-RSAI)". Ottawa: 2012, p. 1-195.